Mef: Perhaps something like this? 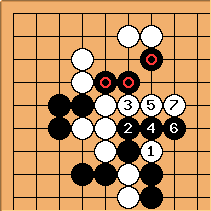 After White is not only hard to catch, but Black has worries of his own if he wants to save the marked group. Charles Yes, this works; there are a couple of other variations that also work; and it is quite interesting to assess those in relation to this one. In fact it is harder to find the line that doesn't work! 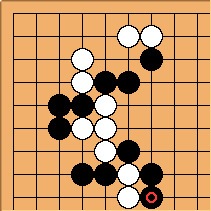 Mef: Indeed, after giving this a second look, It's probably better for white to just jump out at and forgo the sacrifice. Charles I think this way can be recommended. 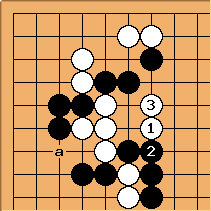 With White gets a bamboo joint shape, which is good for jumping out further. Also, White should try to preserve liberties, since White at a can shortly become important.